As promised here is the very interested article by Johns Hopkins that sums up many of the treatments, dietary changes and other activities I have been/am pursuing. Again, I am AMAZED at everyone’s amazing support with the penny drive. Thank you!!! We have thousands and thousands of pennies at the house ready for a trip to the bank! A few of my amazing friends have come up with their own unique fundraising methods that I want to share with you. 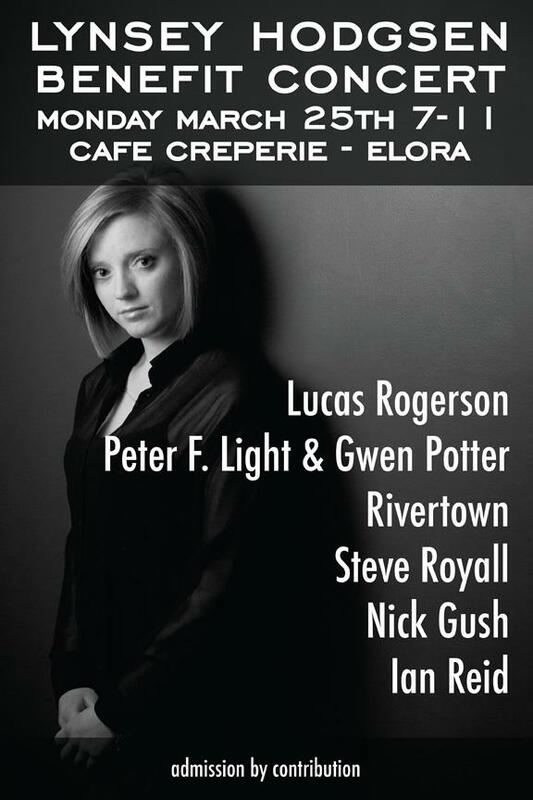 1) Davide Greene and Lucas Rogerson have organized a Benefit Concert Monday March 25 at Cafe Creperie in Elora. See the poster below for more information. It promises to be a great night, with great music and many laughs! It would be amazing to see some of you guys there. 2) My Guelph Girls ❤ are putting together an online auction to help raise funds. They have already gathered many amazing donations, from autographed footballs to homemade dinner to massage therapy, and would appreciate your help in gathering more items before the auction goes live at the beginning on April. Donations of all types are being accepted (merchandise, services, etc.). You or your business will be given full credit for the donation. If you would like to find out more about this or are able to made a donation please contact Lacey Scott at laceylmscott@gmail.com or 519-546-1161. Stay tuned for updates!! I hope you all have a happy and healthy weekend! I hope everyone had a great weekend! I just wanted to update everyone on the past week and what treatment decision we have made. We met with many doctors last week for second/third/forth opinions. They were all along the same lines… do another year, on a different schedule, of the chemotherapy. This would be the same chemotherapy I was on last year, given daily (at a lower dose than I was on) for a year straight. Given the DNA of the tumor, they all agreed that the tumor should react quite well to this chemo. As I have mentioned before, they hope to be able to match the dose I am taking to the growth rate of the tumor to kill all growing cells. This is slightly tricky to do (as I am sure you can imagine!) and you really only have one shot at getting this right. Being on chemotherapy for extended periods of time runs the risk of inducing Leukemia… not something I really want to happen! Dr. Perry at Sunnybrook will be my doctor. He is an amazing man who spent a great deal of time with my family and I when I was there two weeks ago. He is a neurologist who went on to become a neruo-oncoligist and is very knowledgeable about all the latest research and studies. It will be great to have one doctor able to look after all of my tumor related stuff (seizures, headaches, chemo, etc.). I have an MRI scheduled for April 19 at which time Dr. Perry will re-access the size/growth and determine if I should start treatment then. If not, I will go for frequent MRIs until the time is right. In the meantime, I will continue with all my complimentary treatments to help prepare my immune system and maybe even stop the growth of the tumor. Steve and I have adopted a lactose-free vegetarian diet, which has been proven hundreds of times by anti-cancer. The research is fascinating, and quite scary, about the effects of meat and dairy products on the body. I will post a great article in the coming days by Johns Hopkins (leading cancer facility in the world) which sums up all of the avenues we are exploring. A fascinating read! Thanks for all the support with the penny drive! They keep on coming…Remember to check out the Penny Drive page for the latest info on drop off locations! A couple weeks ago a photographer I had the opportunity to work with during my time at the Elora Mill approached me about his upcoming gallery opening featuring “a collection of basic yet breathtaking photographs of women from Elora and Fergus that shows an authentic side of beauty rarely seen these days”. He heard of the penny drive and wanted to assist in fundraising. I was/am very touched by his generosity! Please read below for a bit more about Davide Greene’s gallery opening THIS Friday, March 8 at 7:00pm and his fundraising efforts. I had the opportunity to view some of the shots and they are beautiful! If you are free Friday night please consider making the drive to Elora! I have had the opportunity to photography so many amazing and beautiful local women over the last while and one of those women was Lynsey Hodgson. Lynsey and I met a few years back at the Elora Mill while I was photographing a wedding and even though I have only run into her a few times since her energy and smile is what I remember most about her. 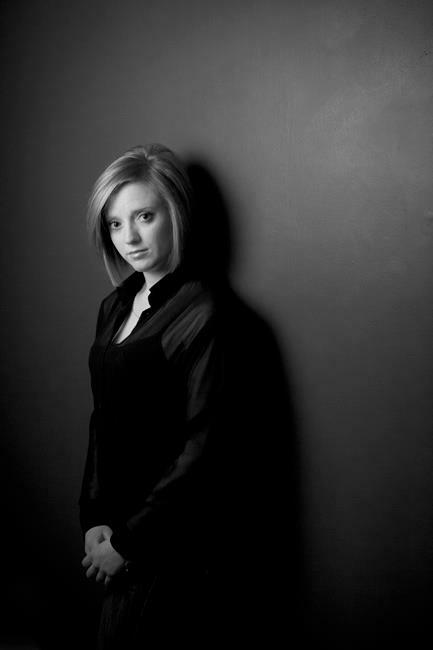 Lynsey at the young age of 24 is battling brain cancer. To help her out we will be holding a silent auction for 8×12 signed and framed silver print of any image from the exhibition and the money will go directly to Lynsey to help with medical expenses. We will also be setting up a Loonies for Lynsey box at the opening. While many photographers have focused their lenses on the beauty of local natural wonders like the Elora Gorge, Davide Greene’s exhibition captures the essence of some uniquely beautiful local women. “Simply Stunning – black and white images by Davide Greene” is just that, a collection of basic yet breathtaking photographs of women from Elora and Fergus that shows an authentic side of beauty rarely seen these days. Without relying on common tricks of the photography trade, like hair stylists, makeup artists and heavy digital retouching Greene manages to bring out the women’s inner and outer beauty in a single striking shot. Greene, an experienced fashion photographer, prefers to let his subjects find their own comfort zone in front of the camera. Instead of directing the shoot, Greene gives the women space to breathe and be themselves, which is easy to see in this intimate collection of photographs. Poised, confident and radiant, the women featured in this exhibition are not typical models and it’s incredibly refreshing. On Friday March 8th, Greene’s exhibition will open at Cafe Creperie in Elora, a perfectly unpretentious place for an exhibition celebrating unassuming natural beauty. The opening gala will start at 7pm, featuring a martini bar, and a DJ and surprise live performer. Just a quick update on the penny drive (which has turned into a lot more than pennies)! We had many, many people drop off donations this week so I thought we better make a trip to the bank before our apartment was full of copper! We spent over an hour at TD this afternoon feeding pennies and change into a machine and this is the AMAZING result… We had 20, 351 pennies plus $229.10 in other change bringing the total change donation to $432.61. How fantastic is that?!? The support has been overwhelming! I have also received almost $800 in other donations already. I am so touched by the support you all have given me! Thank you!! If you have pennies you would like us to pick up or would like your workplace/school listed on the website please e-mail me at lynsey.hodgson@gmail.com. We will probably plan to do a trip to TD every other weekend so don’t worry about rolling them or taking them there yourself! Thank you all for your support. We have a busy, busy week of appointments which I hope will lead us to a good treatment decision soon.